LINTHICUM, Md., Feb. 13, 2013 -- Northrop Grumman Corporation (NYSE:NOC) recently hosted representatives from nearly 100 U.S.-based defense product and services firms interested in supporting its open systems architecture for the U.S. Navy's Air and Missile Defense Radar (AMDR) program. AMDR is the Navy's next-generation radar system planned for the DDG-51 Flight III vessel. The scalable, multimission radar system is intended to provide unprecedented situational awareness to easily detect, track and engage ballistic missiles in high clutter environments. Northrop Grumman is competing for the AMDR program. 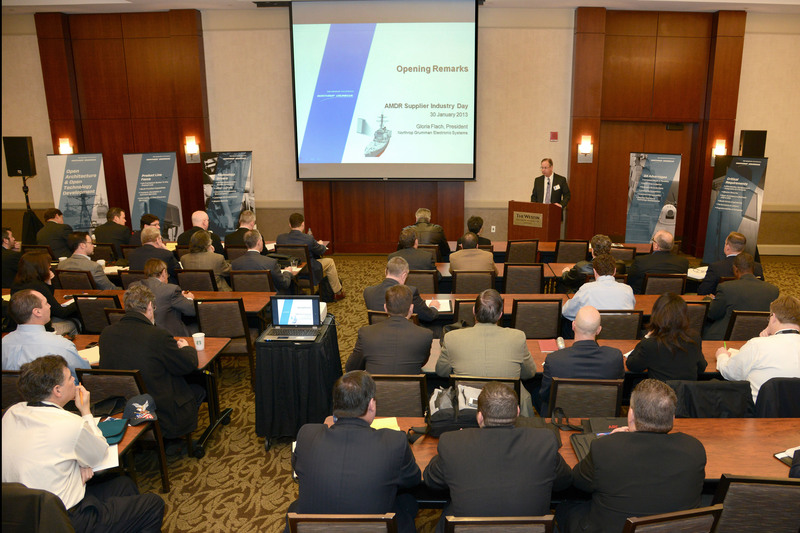 AMDR Industry Day brought together a wide range of technology businesses interested in providing hardware and software components for Northrop Grumman's AMDR offering. Northrop Grumman's AMDR features a modular, open and scalable architecture coupled with an open business model intended to increase innovation and life cycle affordability through broader industry participation, with the objective of lowering total ownership costs. "Northrop Grumman's commitment to affordability, open systems architecture and an open business model is more than just a promise â it's a practice," said Pat Antkowiak, sector vice president and general manager of Northrop Grumman's Advanced Concepts and Technologies Division. "The willingness of so many companies to consider partnering and working in such an open environment shows the utility and relevance of this approach." While the focal point was the AMDR program, the event also served to encourage dialogue among attendees about how to participate in an open architecture environment on other Defense Department programs at Northrop Grumman. That dialogue came during the main sessions and one-on-one breakout sessions held throughout the day. As part of the focus on innovation and supplier diversity, Northrop Grumman encouraged small and disadvantaged businesses to attend and experienced a strong turnout. A leader in active electronically scanned array radars and air defense systems, Northrop Grumman is leveraging its large S-band radar expertise and integration facilities with its offering for the AMDR program. For more information about Northrop Grumman's AMDR Industry Day, visit www.northropgrumman.com/amdr .